With quaint exterior touches, lush tropical landscaping, and close proximity Corpus Christi Bay, Ocean Drive Estates, offering the best apartments in Corpus Christi, Texas, will exceed all of your expectations. 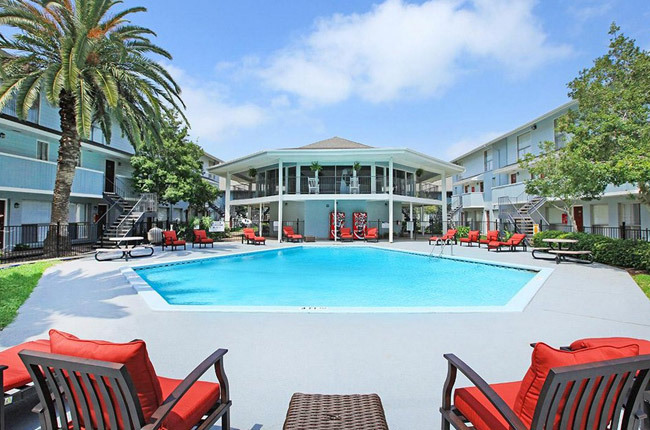 Our beach-style ambiance is only one of the many facets residents love about our community. A gorgeous swimming pool, a picnic and barbecue area, a fitness center with modern equipment, and assigned parking are among the many other conveniences that you will find. They serve as the perfect precursor to our newly renovated interiors, which boast stylish faux hardwood flooring, spacious walk-in closets, and an in-unit washer and dryer connections. Call us today to schedule your private tour, and discover why everyone is talking about Ocean Drive Estates. Located on Ocean Drive, Ocean Drive Estates showcases the natural beauty of Corpus Christi, Texas. Residents are within walking distance of Catalina Pier where they can enjoy fishing, boating, and other water-related activities. We know a long day spent on the water will make anyone hungry. Afterwards, take advantage of the many dining establishments in the nearby area including Rudy’s Country Store & Bar-BQ, Hibachi Grill Supreme Buffet, and Acapulco. Down Highway 358, you also will find a plethora of shopping opportunities at retail establishments such as Target, The Home Depot, Academy Sports + Outdoors, Sam’s Club, and more. We are also less than ten minutes from La Palmera, which offers Dillard’s, American Eagle Outfitters, Bath & Body Works, and Forever 21. Whatever you happen to be seeking at the moment, our central location is sure to fulfill your every wish.